Absalom, the son of King David, was killed at the command of Joab, the commander of one-third of David’s armies. He ordered the Prince’s death even though David asked his commanders to deal gently with his son, because Joab knew that this one man’s life would spare the lives of so many more Israelites. Absalom’s pride would be his undoing. Not only was he a favored son of the king, he disdained the king’s kind favor, abusing his father’s concubines. For he wanted to be king instead of his father, whom God had chosen. Perhaps this was because of vanity. In all of Israel, no one was esteemed more handsome. Absalom only cut his hair once a year, so his hair would typically flow at full length. If my shekel-to-pound conversion is right, his cut hair left on the floor each year weighed five pounds. Our story this week has Absalom, evidently pre-haircut, riding through a forest that had already taken the lives of so many soldiers. Thick trees and rough, broken ground can undo the best battle plans. Absalom suddenly coming upon some of David’s troops, rode under an oak tree and it seems, his long hair got stuck in the branches of the tree. There he was, hanging on a tree, suspended between heaven and earth. Commander Joab was notified and sent three javelins through the heart of Prince Absalom. Let us pray. Father God, you make yourself known to us in the word—written, spoken, and living—and especially through the life, death, and resurrection of your Son. Give us fortitude and courage us to have faith in who you tell us you are, through Jesus Christ our Lord, who lives and reigns with you and the Holy Spirit, forever one God. Amen. The report of Absalom’s death was delivered to the king’s ears and his heart was broken. Even though his son had betrayed him and embarrassed him, Absalom was still David’s son. He loved him and would have gladly traded his own life for the life of the misguided young man. The son of David was hung on a tree, and so, bore a curse, and died so that many could live. Another Son of a heavenly Father died, cursed on a tree, so that all could live. These deaths broke both fathers’ hearts. My favorite scene in the movie “The Passion of the Christ” is at the end when Jesus is about to die on the cross. He looks up to heaven and asks why his Father God has forsaken him, then drops his head in death. Now the camera changes angles, and the scene is blurred, for it is viewed through a single tear drop that falls from the Father’s eye, landing at the feet of his only beloved Son who had given his life for the world. The other Father’s heart was broken over the loss of a world of lost sinners. All who had lived would be lost to an eternal death unless the divine Father’s Son died in their place. And so, his heart is doubly broken, over the death of his creation and the death of his Son to redeem their creation. What to do? The Father sent his Son. Out of a Father’s great love, God sent his Son to be cursed on a tree, suspended between heaven and earth by our sin. 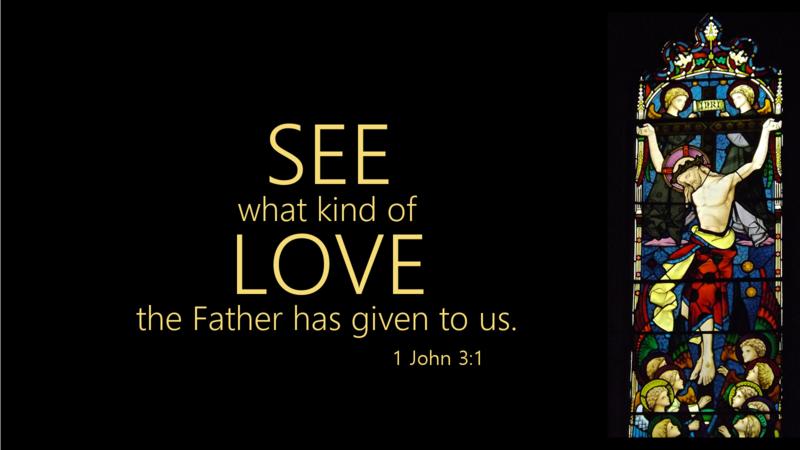 See how great love is the love with which the Father has loved us! God gave his own Son to die for us so that we too might be considered children of the Father. We don’t know what we will be like when days are no more. But we do know what it looks like now. Buried in Christ’s own death on the tree through baptism, we have been reborn to hope in Christ’s resurrection. For his resurrection is our own hope of resurrection from the dead. And the hope we have in him is a pure hope, a certain hope, that purifies us, though we are but dust. Our days are like grass, but we are no longer tinder for the furnace. Thanks be to God! Because the Father’s Son died for us and rose, we of faith who have died with the Son in baptism, will rise on that Day. “For if we have been united with him in a death like his, we shall certainly be united with him in a resurrection like his” (Rom 6:5). The wars of this life, or its forests or perhaps a single oak, may devour us. But we have already died to this flesh. “[We] have been crucified with Christ. It is no longer [we] who live, but Christ who lives in [us]. And the life [we] now live in the flesh [we] live by faith in the Son of God, who loved [us] and gave himself for [us]” (Gal 2:20). Such is the Father’s great and gracious love for sinners, for us, each and all. Peace be with you, in the holy name of Jesus Christ, the Son of the Father. Amen.